There's nothing I love more than a warming bowl of soup during the colder weather and this hearty recipe is perfect for filling you up at lunch or with a bit of crusty bread in the evenings.Over Christmas I made a delicious cola cooked ham with a maple and mustard glaze using this recipe. I had it on the 27th using the leftover Christmas day veggies to make a bubble & squeak (which was perfect for soaking up the alcohol that resulted in my whiskey induced hangover) and also made a delicious brunch of smashed avocado on rye with chilli flakes, a coconut oil fried egg and some of the delicious ham. The soup was made to use up the final bits of the ham and it made quite a bit so I've still got a couple of containers in the freezer. For the cola cooked ham recipe I used a 1.5kg ham but stuck to the measures of ingredients listed in the BBC Good Food recipe. For the soup, there was probably around half of the ham left. It doesn't matter too much (in my opinion) how much ham you use but I probably wouldn't recommend anymore than 1/3 or 1/2 of the ham. I loosely stuck to this recipe from James Martin, making a few adjustments like replacing the cream with Oatly crème fraiche so my dairy intolerant tum could handle the soup without me feeling a bit lousy afterwards. I swear by the Oatly products. Their oat milk is something I drink everyday in coffee, use on cereal or have with porridge. 1. Grab a large saucepan or soup pan and add your EVOO and knob of butter. Heat on a low heat and add your sliced onions. Stir occasionally so they do not stick. 2. 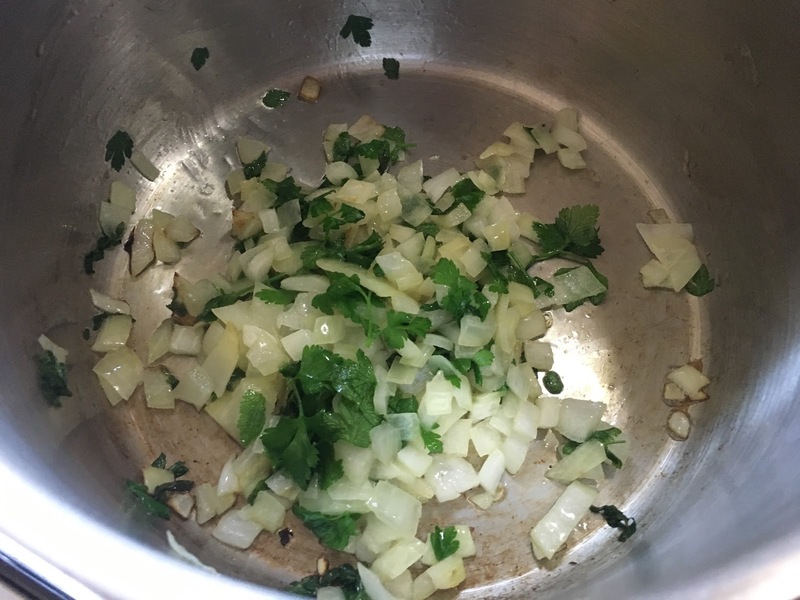 Once your onions have sautéed a little, add your crushed garlic cloves. Stir occasionally. 3. While your onions and garlic are cooking, shred your leftover ham. Add your parsley. Also boil the kettle and add the boiled water to a measuring jug with your stock cube. 4. Add your peas and stock. Bring to a simmer then stir in your Oatly crème fraiche or similar product and stir. 5. After a couple of minutes add your shredded ham hock. I left the soup simmering for around half an hour. 6. Use a Nutribullet, hand blender or similar appliance to pulse to form a puree. You may want to add more water if the soup is a little too thick for you.